Sunday is market day in Hikkaduwa, and lucky for me, our guest house is a one-minute walk down the railroad tracks to this amazing temple to all things delicious in this town. I know this may sounds sacrilegious and gluttonous to many, but the same reverence and love people sometimes reserve for their faith, I hold for food. Especially when I'm traveling, I regard every meal as this sacred, precious moment in my life to experience a new flavor in someone else's culture -- to appreciate and savor all the time and labor sacrificed by farmers, traders, cooks and everyone else in between that made this dish possible. My mother (no joke) told me recently that love always changes in a relationship. I have to remember that it's temporary and can disappear as quickly as it manifests itself. But my stomach will always be hungry -- this I can count on. I must find a man who knows how to eat like I do, so we can happily share meals together every day. So when I stumble across markets like this one in Sri Lanka, it's like finding this special place of worship -- an edible holy grail. 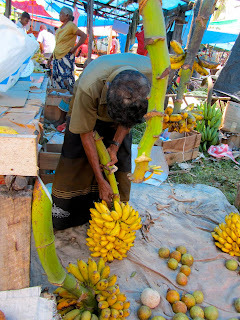 I love the opressive heat, the dust, the smells of ripe fruit and exotic spices, the frantic yelling in Sinhalese, the fresh piles of produce and unfamiliar sweets, the chaos! I spent less than a couple US dollars total and come away with a 100-piece bag of "honey corn" cookies (orange, cone-shaped pastry filled with basically pure sugar...the filling has this nice grainy honey texture but is unbearably sweet); a bunch of adorable, little bananas (apparently there are over 60 varieties of bananas in this country! ); and five small packets of spices. 1. Afternoon of splashing in the ocean, playing in the sand, and starting an in-the-water beach brawl among a dozen Sri Lankan teenagers and 20-somethings. Punches were thrown. Bodies slammed into the water. We later realized our snorkeling guides were defending our honor after one of the opposing group of drunken drum circle boys rather inappropriately groped me underwater and then asked in Sinhalese how much I cost to rent. Have never witnessed such a dramatic display of misogyny and chivalry all at once. 2. Refreshing downpour during our snorkel. Beautiful. Saw a big turtle! Got a sea cucumber shoved in my hand. Dazzled by fat, neon fish. 3. Food. Glorious food! Crazy spicy, incredibly flavorful, veggie curries with rice. Coconut sambal. Dal. Green beans. Cabbage salad. Coconut roti. Veggie stir fries and omelets. Papadum. Cucumber and tomato salad seasoned with lime (fresh from the backyard!). Papaya smoothies (also from the backyard!). Milk Ceylon tea. Coconut water. Everything here is infused with coconut, and from this day forward I would like to infuse my entire life with coconut. 4. The family who runs the guest house (Star Holiday) is lovely. We flip through wedding albums. Discuss the 30-year history of the place. Inquire (without success) about favorite Sri Lankan specialties...after much discussion between the wife and her mother-in-law, they turn to us in English with only these words: "Watermelon. Yes, or Cucumber." 5. The mom, wife of the late owner of the establishment who passed away last year, cooks our meals, and she seasons each entree with the love only a mother could possess. Her dal curry is the best of the trip thus far. Grew up in Chinese restaurants in Austin, Texas. Left cube life as a PR foodie in NYC/Boston to become a wandering yogi/farmer/eater/student. This blog chronicles a year of discovering that to think outside of the box, you usually have to get out of the box. Currently residing out of the box and on a mat instead: www.yogiaustin.com.